Take a step back for one minute, think what would happen if you come into your business Monday morning to find a third of the company files missing? Or worse, half of them - or God forbid all of them. How would this affect your business - how much downtime would you have? Simply loosing a 1/3 of your business' data would result in a massive loss. Imagine having to contact 1/3 of your customers to ask for updated information for next months billing because you suffered a catastrophe in your IT department. 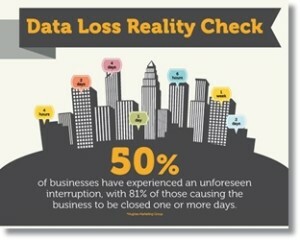 Data loss is something that can happen to any business at anytime. Simple things like a drive going bad, or your on-site backup Flash drive goes bad. Other things like Viruses can cause massive downtime and data loss. Looking at it from an IT perspective, it is often faster to re-install a computer and restore it's backup data, compared to the countless hours to find and remove some types of viruses. A new threat in the world is now more than ever making this true. Most Viruses from the old days copied your contacts, infected your programs and were just a nuisance, like basic Worms and Malware. The new threat is a bit more malicious, causing you to actually loose your data by encrypting it with sophisticated algorithms, then demands payment to get your data back, effectively holding your data hostage! We're talking about Ransomware, a nasty type of malware that is infecting a large percentage of businesses and personal systems that has increased 35% in 2015 according to Symantec. So how do you protect yourself or business from data loss? There's no sure fire way to keep your data 100% safe, let's be honest and call a duck a duck. But there are things you can do to help make that loss less likely. At Microtronix ESolutions we practice tier based backup and data loss prevention techniques with all our customers in Paulding County, Ohio and all of Northwest Ohio. Tier based backup solutions means multiple points of protection. Some companies suggest the best backup is having multiple on-site drives that you switch out every day, taking one home. This is a single point of protection and leaves more margin for error - at Microtronix we say 3 points are better than one! Other companies recommend 100% cloud based solutions using one of many Cloud hosting solutions. To give one example, in early 2015 Amazon had a loss of their own, dropping a large percentage of Netflix servers in 4 sections of the U.S. over a 48 hour period. This was with a single point of protection. Your data is irreplaceable, at Microtronix ESolutions we recommend customers use multiple solutions at the same time to help mitigate loss and downtime. Read below to find out how Microtronix ESolutions helps you protect your data. We backup your data locally to drives on-site, this way if you have data failure the data is right there to restore immediately and you have less downtime. No waiting for your internet to download all your files and get back to business faster. Microtronix recommend's off-site backup on Linux servers with versioning and here's why we use Linux servers for our customers data. Security! Windows is getting better at security, but the security of Linux is top notch! Some of the IT forerunners like IBM and HP have been trusting Linux in-house, for years. Directories and files can be isolated and not affect other users on the same machine. This means your data is safe from other user's data and possible viruses that they might bring with them. It also means that if a single user account gets hacked, it's much harder for the hacker to get into the main server and all other files. Linux uses a different file storage system than Windows (EXT4), in-case of hard drive failure, full data recovery with Linux is much more likely than with Windows. We use RAID10 Array for our Linux servers, meaning in case of hard drive failure we have 3 other drives containing mirrored data (exact copies) in perfect condition. Linux servers help us to protect your data from viruses. Yes, there are viruses for Linux, however Windows viruses will not function on a Linux server - this means uploaded files containing a virus for Windows, cannot spread to other files on the server. We use versioning for both local and remote backups. Versioning is a technology where new backups don't replace old backups, old files are kept under date-stamped versions of itself. This means that if your files become infected we restore the prior version of file. With Linux the infected file the backup software uploads won't infect the previous version. Lastly we recommend Amazon Geo-Sync. Daily backups of our servers are automatically sent to Amazon Glacier servers for cold storage! You can't get much more secure than triple backups! Our years experience in the field has shown that multiple backup locations lowers the risk of data loss. The automated backup software we recommend, constantly monitors your files for changes. When a change is detected it will automatically upload that file to our servers and your local backup at the same time! At Microtronix we work hard for our customers to find the best backup solutions for your business, no matter what they are. If you would like us to assess your backups and see if they are working for you, contact us today in Paulding, Ohio and all of Northwest Ohio to schedule a free Security Analysis and Tech Review of your office and personal systems. Our goal is to make each customers data safe and secure.